PITTSBURGH -- Seventy-one percent of Millennials are visiting multiple stores to find the best deals, compared to 57 percent of Baby Boomers, according to the second in a series of reports by First Insight, a technology company transforming how retailers make product investment and pricing decisions. 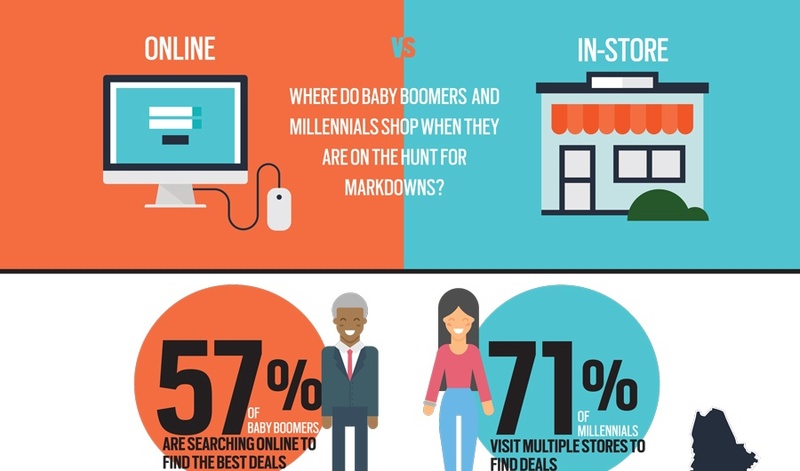 While Millennials are still going online to search for deals (82%), the study points to shifting shopping behavior within both generational groups, as more Baby Boomers (65%) are searching online for the best price than in-store. The First Insight survey queried 750 participants in the United States on their shopping habits, purchase behavior, discount expectations and influences driving purchase decisions. According to the results, the Northeast region of the U.S. is seeing the greatest behavioral shift between where the Baby Boomers and Millennials look for deals. Additionally, higher income respondents overall are searching online over in-store, particularly Baby Boomers. In the Northeast, twenty-five percent more Millennials are visiting multiple stores to find deals (73%) than Baby Boomers (48%) who prefer going online to look for deals. Eleven percent more Baby Boomers responded they search online more (59%). In the West, Millennial respondents are almost as inclined to look in-store for deals as they are to look online (72% versus 76%). Baby Boomers are also showing a migration to online in this region, with 66 percent of those surveyed searching online, versus only 59 percent in-store. In the Midwest, the migration of Baby Boomers searching for deals online is the most pronounced, with 14 percent more Baby Boomers looking online for deals over in-store (68% versus 54%). While a comparatively low sixty-six percent of Millennials are visiting multiple stores when compared to other regions, the percentage is still 12 percent higher than Baby Boomers. Baby Boomers are visiting multiple stores and searching online almost equally in the southern region of the United States (63% versus 67%, respectively). However, stores should still be ready for the discount-searching Millennial as eight percent more (71%) are visiting multiple stores looking for deals than Baby Boomers. While annual income appeared to be less impactful on Millennial behavior, Baby Boomers that make $100,000 or more a year are 17 percent more inclined to search online for deals than in-store (77% versus 60%). For Baby Boomers making less, the difference was far less significant, with only six percent more inclined to look online versus in-store (62% versus 56%). First Insight’s findings are based on a targeted sample of 750 respondents from three distinct demographics: Baby Boomers, Generation X and Millennials in the United States. The survey was fielded in March 2017 and was completed through proprietary sample sources amongst panelists who participated in online surveys.